Planning to attend an Italian show in October? Click on each tour date to find all the information on the venue and the links to the tickets pre-sale. Feel free to post in this thread if you need help or just to let us know you'll be there! A special thanks goes to fellow Con-Fusion members koch, who gathered all the precious information to create the Italian topics, and satellite, who helped translating the texts. When: Saturday, October 17 2015, 8:00 p.m.
Mediolanum Forum – formerly known as Fila Forum, Datch Forum and commonly referred to as Forum di Assago – is a sports arena located in Assago, 3 km outside Milan and 10 km from downtown. It has a volume of 450,000 cubic metres, a covered area of more than 40,000 square metres, a central arena that can host up to 13,000 spectators over three levels. Take a virtual tour of the venue. The Mediolanum Forum can easily be reached by car. It’s located between the start of the Milan-Genoa motorway (A7) and Milan’s Tangenziale Ovest (A50) exit “Assago-Milanofiori”. The Mediolanum Forum is served by a dedicated stop of Line 2 (green line) of the Metro. The stop is called “Assago - Milanofiori Forum”, only 7 stops from Cadorna. See the timetable. You can take the Metro from any train station (Milano Porta Genova, Milano Cadorna and Milano Centrale). If you are flying to Milan, shuttles and buses will take you from the airports of Milano Malpensa and Milano Linate to Piazzale Cadorna and Stazione Centrale. You may find additional information (parking, accessibility, hospitality) on the Who We Are page on the Forum’s website. 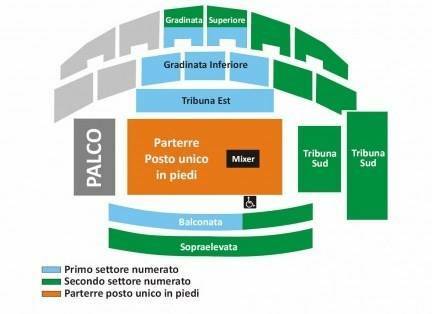 When: Sunday, October 18 2015, 8:00 p.m.
1st Sector = C/D tiers (blue) of "gradinata inferiore" (lower stand), tribuna est (eastern stand), tribuna sud inferiore (lower southern stand) and C balcony (blue area of "balconata"). 2nd Sector= D/E/F tiers of the higher stand ("gradinata superiore"), E/F tiers of the lower ("gradinata inferiore"), "Sopraelevata" B/C" and higher southern stand. 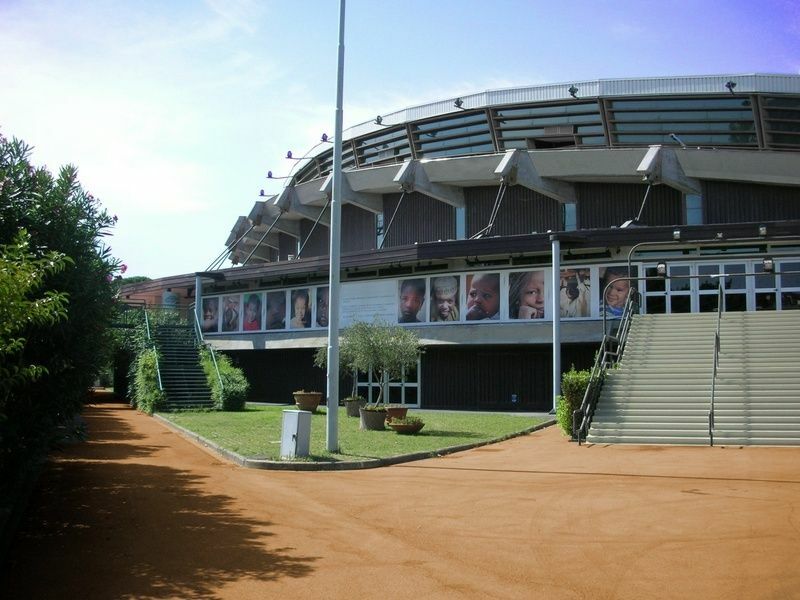 The Nelson Mandela Forum (formerly known as Palasport) is the most important sports arena in Florence. In 2004 it was renamed after Nelson Mandela to highlight the Forum’s mission of gathering an open, global and multicultural community through its many cultural and sports events. From the A1 highway, take the Firenze Sud exit. Follow the spur road until the traffic light. Keep left and follow directions to Firenze Centro and Stadio. Continue on Lungarno Aldo Moro and Lungarno Colombo, then turn right on Via del Campofiore. At the second traffic light after the railway overpass, turn left on the second road, Viale Cialdini. It will take you to the main entrance of the Mandela Forum on Viale Paoli. From the train station Campo di Marte: The venue is just 150 meters from the station, so you can walk there! 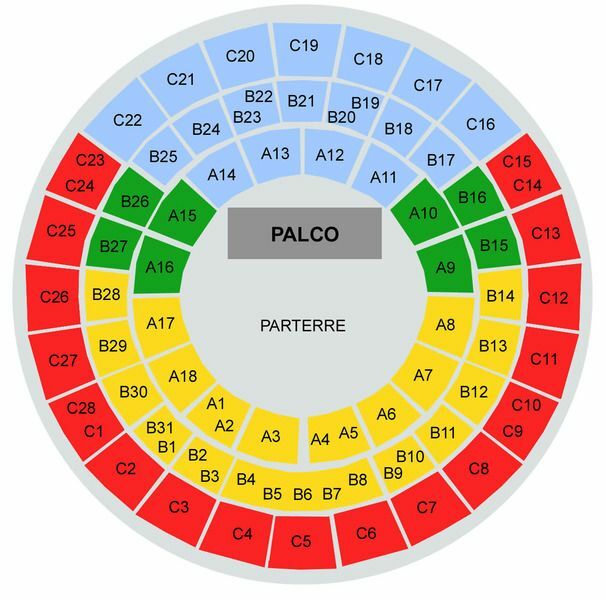 When: Tuesday, October 20 2015, 8:00 p.m.
Central Stand ("Tribuna centrale numerata") = Lower central tiers, from A18 to A7, and Higher central tiera, from B30 to B12. 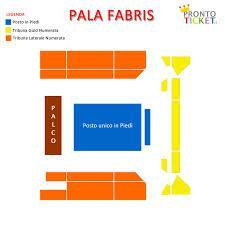 PalaLottomatica, commonly known as PalaSport or PalaEur, is a sports arena in the EUR district of Rome. Its circular shape and impressive dimensions (the dome has a diameter of 95 m) make it one of the most peculiar arenas in Europe. 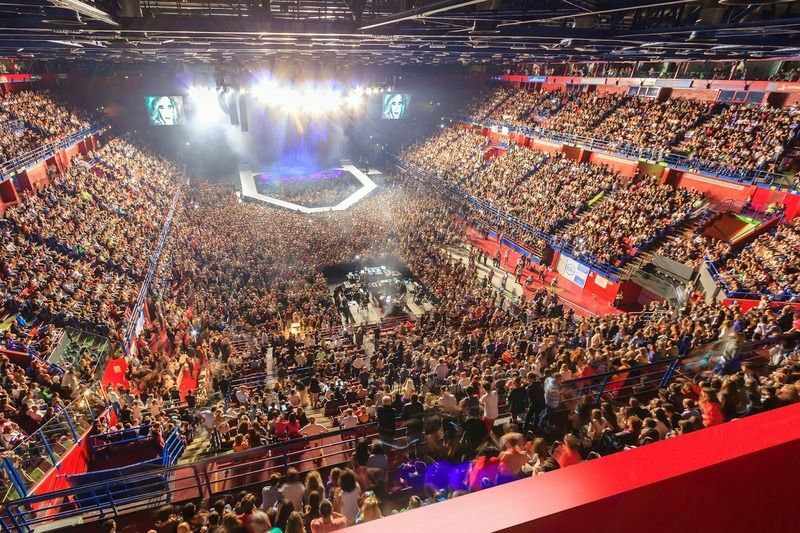 The PalaLottomatica and the Mediolanum Forum in Milan are members of the European Arenas Association, which includes the 32 best European multi-purpose venues. From the Grande Raccordo Anulare (GRA, the ring-shaped motorway around Rome), take Exit 26. Continue on Via Pontina and Via Cristoforo Colombo for about 2.5 km. 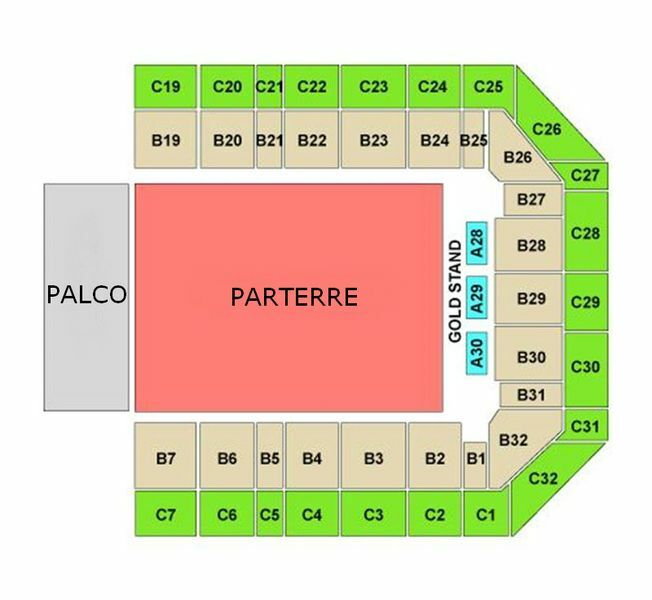 You will find the PalaLottomatica on your left. By Metro: B Line until the EUR Palasport stop. Walk for about 400 mt on Via Cristoforo Colombo. By Bus: Bus n. 714 from the train station Roma Termini. The venue’s stop is the last one, Palazzo Sport. If you are located in other areas of the city, visit the ATAC website and check the itinerary and timetables of the many buses reaching the venue: 671A, 671R, 714A, 714R, 780A, 780R, 791A, 791. When: Wednesday, October 21 2015, 8:00 p.m.
Kioene Arena (also known as Palasport San Lazzaro) is the first indoor sports arena of the town of Padova. 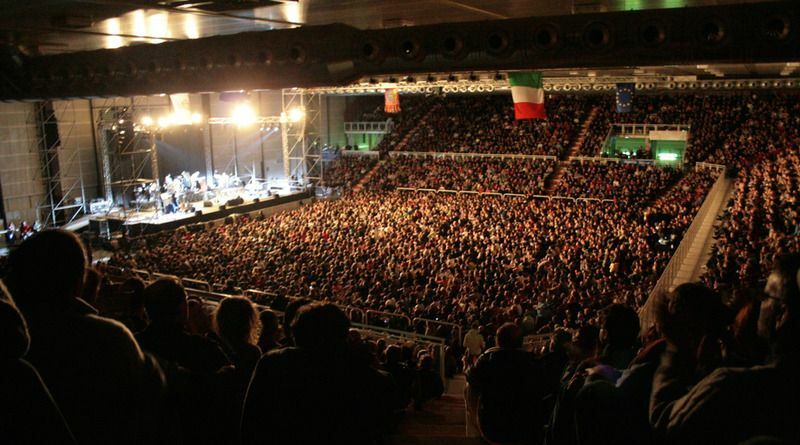 It hosts sports events (basketball, volleyball, handball, boxe, fencing) and has recently grown to be one of Italy’s leading venues for live music. The venue is very close (approx. 1 km) to both the A4 motorway and the Tangenziale Est ring road. From the A4 motorway, take the Padova Est exit and follow directions to Palasport San Lazzaro. From the Tangenziale Est (direction: Castelfranco) take exit 18 “Padova San Lazzaro” and follow directions to the Palasport. From Padova’s train station, take the bus n. 18 (n.14 on Sundays and holidays). The venue's stop is Palasport San Lazzaro. Check the timetable. The “Marco Polo” airport of Venice is approx. 40 minutes from the venue. Can't wait to say hello! Hi tris! And welcome to our forum. Hello tris, welcome! Great news! It will be exciting to follow the tour together... see you in October!